Often referred to as a rodent, bats actually have little in common with rats or mice. They are the opposite of filthy; bats are meticulous about keeping themselves clean. The smell often associated with the presence of bats comes from an accumulation of guano (bat feces) and urine below their roosting areas. Bats have tiny teeth that are very sharp, making them able to penetrate human skin. This does not mean, however, that they are aggressive. Often bat bites occur because the bat feels threatened and is trying to protect itself. As such, bats do not attack people. Sometimes bats swoop downwards towards a person, but they are attempting to feed on the insects attracted to human body heat. Humans should avoid direct contact with bats, however, since they can be carriers of rabies. Rabies infects the central nervous system, ultimately causing disease of the brain and death. This is completely preventable, and bats that come in contact with humans should be tested for rabies so that if positive the affected party can receive a rabies shot. Bats often enter homes in search of an area to roost. While they do not roost year round, they are often loyal to their abode and return at the season’s change. Due to this, it is important to eliminate ways for bats to enter the home once their presence has been discovered. Because bats are so small, even the tiniest of cracks or holes make for perfect entry ways for bats to come into the house. They often gravitate towards rooftops, behind basketball hoops, attics, or crawl spaces. Not all bats enter willingly; some inexperienced or juvenile bats may enter the home mistakenly by falling down the chimney, flying in open windows, or down attic stairs. In order to see where bats are entering and exiting the home, observing the outside of the house at dusk when the bats will exit to feed can be the key. While this may involve stationing several family members or friends around the home’s perimeter to look in multiple spots, it is the most effective way to discover where the bats roost is located. An experienced exterminator can also help you identify the bats' entry points, eliminate the roost, and seal off crevices of your home to prevent their re-entry. Before considering bat removal, is it imperative to know if the bat has come into any sort of contact with humans in residence. Any bat who has come into contact with a human or was in the room with a sleeping human should be captured rather than released and brought to local animal control for rabies testing. Only 5% of bats submitted to the Massachusetts Department of Public Health test positive for rabies, and since rabies shots are often expensive, testing the bat for rabies can help save the cost of the shot should it not be needed. If the bat is inside your house in a furnished area, it is important to follow certain guidelines to ensure safety for both family members and the animal. First, isolate the bat. Since bats weigh no more than a couple of ounces, they can easily slip out or hide in tiny spaces. Close off other parts of the house, and put a towel at the bottom of the closed door to make sure the bat will not be able to crawl through the space. Keep an eye on the bat! They can easily get lost even in one room since they are so small and burrow easily, so it can save hours of time if the bat is kept in plain sight. If you are trying to capture the bat, wear leather gloves and long pants. This helps avoid the potential for bites. If the bat has landed or is flying around, try to gently knock it to the ground with a broom or towel. Bats are more vulnerable and slow moving on the floor. Make sure not to injure the bat’s head! The brain is needed for rabies testing; damage could make rabies testing impossible to complete. An empty coffee can, wastebasket, or fishing net are ideal containers for holding the captured bat. Should you suspect the bat may have been in contact with a family member, this is the point at which to contact the Massachusetts Department of Public Health. Tell the person with whom you speak that you have a bat in your home and there is potential exposure to rabies. They will instruct you on how to move forward, or they will come over to handle the situation from there. If the bat has not come into contact with any humans, it is perfectly acceptable to let the bat free. Open an outside window or door in the room that contains the bat and it should be able to find its way out in a few minutes. You may not want a bat in your house, but they are great critters to keep in the environment of your home! Bats consume thousands of insects per night, including agricultural pests and nasty bugs like mosquitoes. 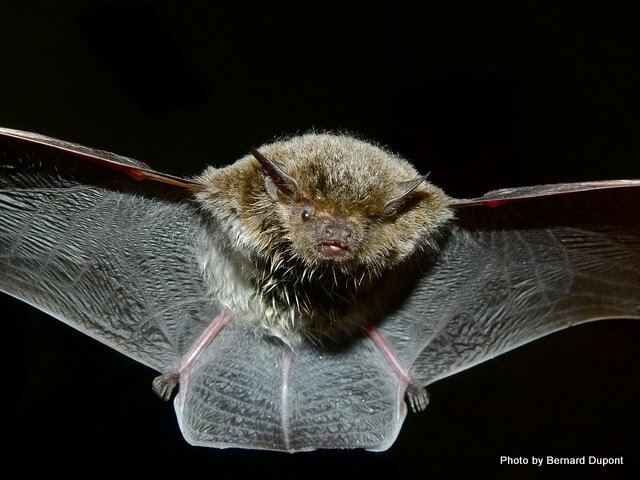 In addition, bat populations are decreasing with the low levels of available habitats. Many types of bats are even endangered. To help, you may consider installing a bat house. Similar to a bird house, they provide a safe home for the bats, and will deter the bats from attempting to find a new place to roost somewhere in your home. More information on how to install a bat house can be found through Bat Conservation International. Be sure not to miss our information on Termites and coming next week, Buzzers and Crawlers. The Bat Guy. Bat Information Myths and Facts. Retrieved from http://goo.gl/jTxnOE. BatGuys Inc. Help! There’s a Bat in My House!. Retrieved from http://goo.gl/rncXqQ. Mass Gov. Energy and Environmental Affairs. Bats. Retrieved from http://goo.gl/drCGQM. Get Bats Out. Do you have a bat in your house right now?. Retrieved from http://goo.gl/DbWf1c. Bat Conservation Trust. Living with bats. Retrieved from http://goo.gl/ijXWL5. Center for Disease Control and Prevention. Rabies. Retrieved from http://goo.gl/eobDWT. Bat Conservation International. Install a Bat House. Retrieved from http://goo.gl/eZxSUR. Organization for Bat Conservation. Why Bat Houses are Important. Retrieved from http://goo.gl/cQ0Szp. Dupont, Bernard. (March 5, 2012). Cape Serotine Bat (eptesicus capensis) [image]. Retrieved from https://goo.gl/1B2aiv. Dwell360 is a residential real estate firm based in Newton, Massachusetts, servicing the cities and suburbs of Greater Boston. We are focused on our customers and seek to educate about household pests. Search for homes in Massachusetts and then give us a call.